I’ve been sharing a lot of recipes with cheese analogues the past couple of months and I thought I’d switch it up this time. 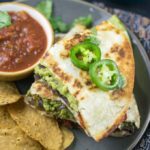 I’ve made great vegan quesadillas over the years using various cheese substitutes, but how about a plant-based quesadilla that doesn’t rely on anything cheezy at all? Consequently, the vegan quesadillas that I have for you today are of the avocado variety. Instead of making an extra component of cashew mozzarella or the like to hold the tortilla together, mashed up seasoned avocado and refried beans do that job for us today. This no cheese version doesn’t taste the exact same as a non vegan quesadilla, but does it need to? With delicious fajita-seasoned stir-fried vegetables and creamy avocado, I certainly don’t miss the other stuff. Hummus – this sounds rather delicious, but distinctly Mediterranean tasting. Have any of you tried it? Mashed sweet potato – surely tasty. I know from my sweet potato tortilla soup that this can be a great flavor combo. Beans blended up with tomato paste and nutritional yeast – I’m very intrigued by this version and will report back here when I’ve given it a try! Daiya – I’m sure you already know how this makes me feel. 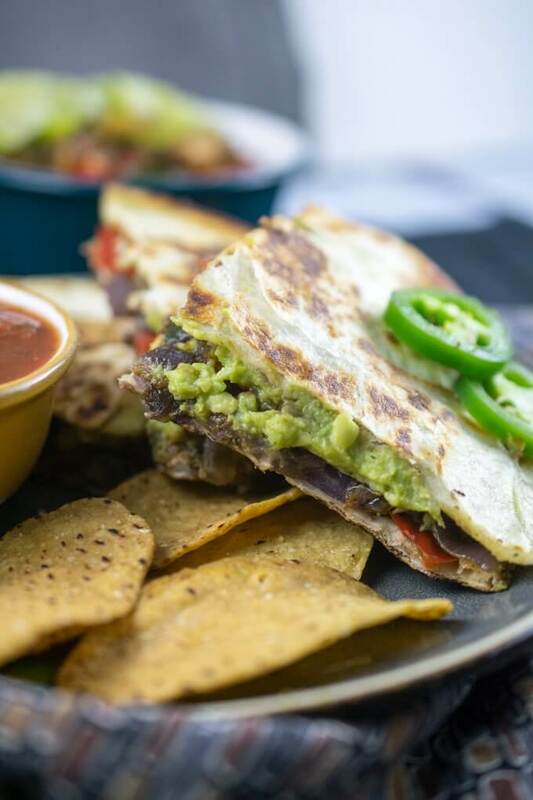 Clearly there are a lot of fun variations possible but you can’t go wrong with everyday-tasty smashed avocado, refried black beans or pinto beans, and veggies in your basic vegan quesadillas. I kind of think of it as avocado toast in tortilla form, which means you know it’s gonna be good. Enjoy! 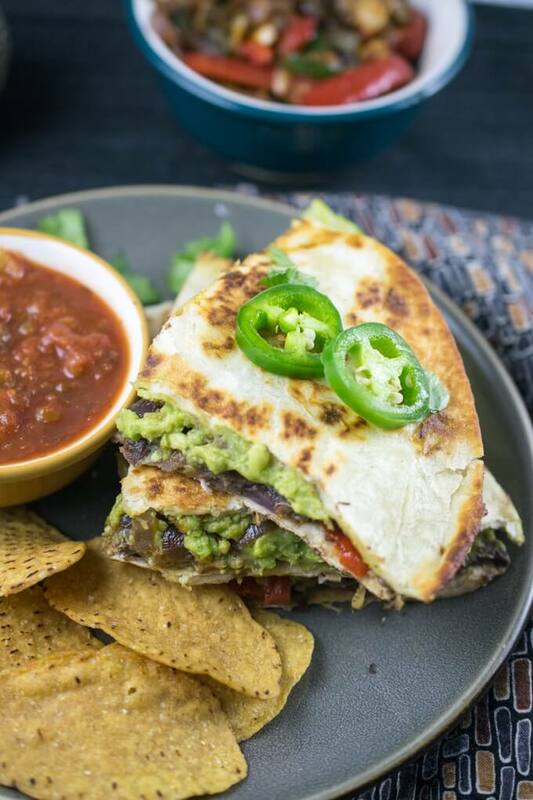 Your basic vegan quesadillas made with everyday ingredients: refried beans, mashed avocado, and stir-fried vegetables. Heat the olive oil in a large skillet or wok over medium-heat high. Get the spice mix ready by adding all of the spices to a small bowl. 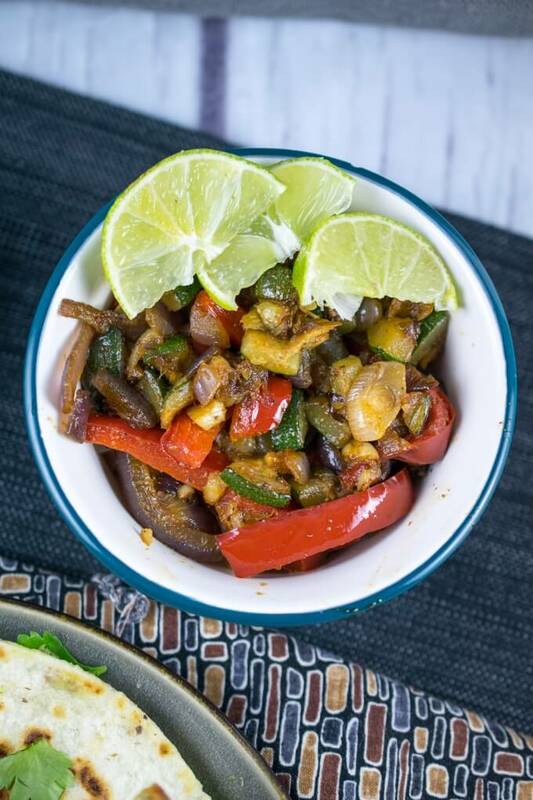 Once the oil is hot, add the bell pepper, zucchini, and red onion. Cook the vegetables over medium-high heat, stirring frequently, until nicely browned and softened, about 5 minutes. Add the spices and cook for 1 minute more, or until fragrant; remove from the heat and set aside. Stir the lime juice into the mashed avocado. Season to taste with salt and pepper. 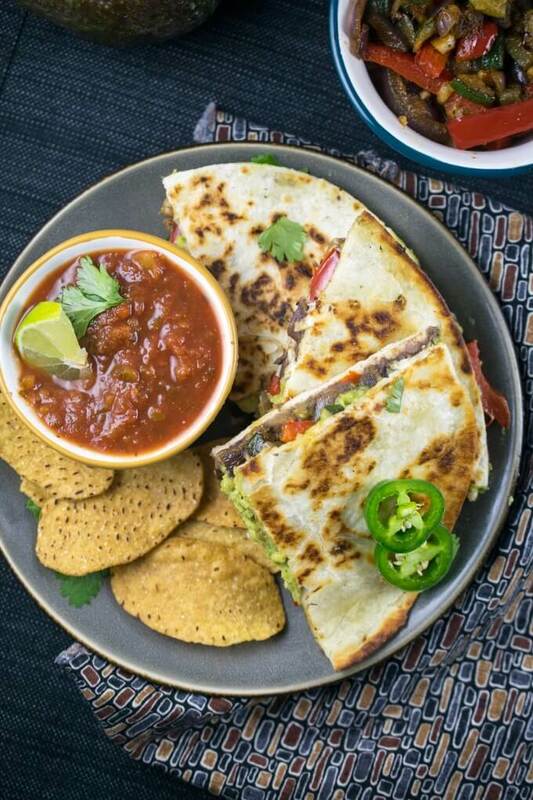 Fill your vegan quesadillas. Take a tortilla and lay it flat. Onto one half of it, spread about one sixth of the refried beans, then avocado, and vegetables, and chopped fresh cilantro if desired. Fold the tortilla in half to close it. Repeat until all of the tortillas are filled. Clean out your skillet and heat it over medium heat. Lightly oil it and then add a folded vegan quesadilla to the pan. (Cook 2 at a time if you have enough space). Cook until lightly browned and crisped, then flip over and repeat on the other side; about 3-4 minutes per side. Repeat until all of the quesadillas are cooked. Serve with salsa of choice! Nutrition will vary depending on the refried beans and tortillas used. If you must use vegan cheese in these quesadillas, I heartily recommend my cashew mozzarella or Miyoko’s mozzarella! A friend of mine showed me this recipe. She came across it on pinterest. i may or may not have lost a bet so now I have to make these for her BUT after reading through this i have to admit this looks really good. This sounds delicious!! I’m looking to make the veggies and store for the week so I can just make me a quesadilla when I’m in the mood for a quick snack. Do you think that I could compile it with the cold veggies and they heat up well after I construct and cook the quesadilla? Or do you think I should reheat the veggies and then compile & cook? Any suggestions welcome! Just looking to brainstorm. I would think that they should heat up in the process of cooking the quesadilla, enough to be enjoyable. You could set them out at room temp first while you get out the tortillas and such, to give them a little bit more time to warm. But I think it’d be fine anyway. Thanks! I agree! I’m going to let you know how it works out. Worked great! I just remade them with the cold ingredients and everything heated up together & it was delicious!! THANKS FOR SHARING!! yum! going to make these this week!